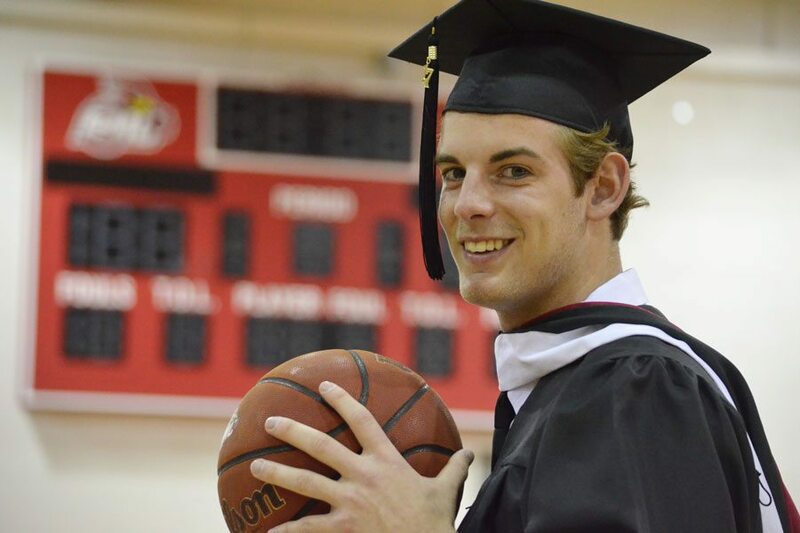 Wylie Ferron ’17 may not be dressed in his usual Cardinal red, but he will definitely have the home-court advantage when he dons a cap and gown and hits the gym floor Saturday for Saint Mary’s University’s Winona commencement ceremony. As a three-year captain of the men’s basketball team, Ferron has engineered many successful basketball performances during his college athletic career; this fall he’ll pursue a graduate degree in civil engineering. For four years, Ferron achieved high scores in basketball, closing out his senior year as the team’s scoring leader, averaging a career-best 14 points per game. A Math major and Chemistry minor, he also scored well in classes ranging from probability to abstract algebra. But he admits the abstract, theory-based math classes stretched and challenged him. He said juggling athletics and academics taught him about time management and kept him on task. It also taught him leadership skills he believes will be valuable as he heads to Oregon State in Corvallis, Ore., to pursue a master’s degree in civil engineering. He looks forward to studying at a renowned engineering school with facilities dedicated for structural testing and geotechnical engineer. The school’s wave lab is internationally recognized and features the worlds’ largest tsunami wave basin. This summer, he’ll complete an internship with Danny’s Construction in Shakopee, which completed much of the structural work for U.S. Bank Stadium. Eventually, his goal is to lead construction teams as a project manager on large-scale developments like stadiums, bridges, and large buildings. “I think one of the things that will benefit me the most in my career in management has been learning how to work together as a team,” he said. More information about Saturday’s Winona Campus commencement ceremony.